General Motors, its river of red ink stemmed by a trip through bankruptcy court, reported a narrower quarterly loss and said it would start repaying billions of dollars in government loans that helped keep it alive. GM lost $1.2 billion for the third quarter - far less than the $6 billion it lost in the first three months of the year, before GM was transformed by a stay in Chapter 11. The company credited a sharp reduction in debt and sales of new models. In what it called a sign of progress, GM also pledged to start paying back $6.7 billion in U.S. loans. But the money will come from a contingency account full of government cash, leading critics to question just how healthy the automaker really is. In one sign GM is indeed on firmer footing, it took in $3.3 billion more in cash than it spent in the third quarter. In the first quarter, the last one for which it reported results, GM burned through $10 billion in cash. GM warned it will face other costs that will bring down earnings in the coming months, including restructuring in Europe and as much as $700 million to shutter dealerships. And there are still questions about the strength of the auto market and the economy. "We're seeing signs of, I won't call it a recovery, but certainly stability," CEO Fritz Henderson said. The repayment of government loans will begin with a $1.2 billion installment in December. GM said it plans to repay the debt over the next two years and possibly as early as next year. That money will come from a $16.4 billion contingency fund set up by the U.S. government in case sales worsened or other problems cropped up. The seemingly circular payment plan was already stirring controversy in Congress. "What is the logic in repaying government loans with taxpayer dollars?" asked Brooke Buchanan, a spokeswoman for Sen. John McCain, R-Ariz.
Brad Coulter, director of O'Keefe and Associates, a financial consulting firm near Detroit, said using government money to pay off the government debt is partly a public relations move. But it also indicates rising confidence at GM, which may feel it won't need all the contingency money, he said. And GM did hedge its bets, opting not to repay the whole amount in December so it still has cash if conditions change. Henderson said GM felt it was prudent not to repay the whole amount in one shot. The government owns 61 percent of the company and has given GM a total of $52 billion in aid, $45.3 billion of which could be repaid when the new GM makes a public stock offering, perhaps as early as next year. The General Accounting Office, which serves as Congress' auditors, said last week it was doubtful the government would get all its money back. 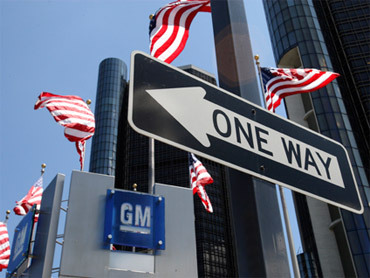 Henderson said that depends on the price of GM stock, which he intends to make valuable by managing the company well. "It is my mission to disprove the GAO," Henderson said. GM said its improved performance was fueled by new products, including the Chevrolet Camaro muscle car and the Chevy Equinox and GMC Terrain midsize crossover vehicles. The company's top sellers through October were the Chevrolet Silverado pickup truck and the Impala, a full-size car. The host of new vehicles means GM is charging more on average that its competitors - in some cases, a lot more, reports CBS News correspondent Dean Reynolds. While the car site Edmunds.com says its surveys show an increasing interest in the new models, the same surveys show GM's pricing may well be discouraging consumers from buying what it's offering, Reynolds reports. The automaker was also helped by having been stripped of many of its debt obligations in bankruptcy court. Before Chapter 11, GM was weighed down by a huge debt of almost $95 billion. That has since been cut to $17 billion. GM paid $250 million in interest for the third quarter, far lower than the $1.1 billion it paid in the first quarter. GM's global presence also helped - particularly in China, where the emerging middle class is hungry for cars. GM earned $429 million before taxes and interest at its Asia Pacific unit, and $245 million in Latin America. It had lost $651 million before taxes in North America and $437 million in Europe. Coulter cautioned that losing money in North America is one of the biggest threats to GM's turnaround. "North America has to get back to being profitable for this plan to succeed," he said. Henderson wouldn't predict when GM as a whole would become profitable. GM's shares are no longer listed on the New York Stock Exchange. But the automaker's bonds, which mature in 2033 and will be converted into equity in the new company, jumped $3.75 to $21.25. That was the highest closing price since January. Third-quarter profits were generally weak across the auto industry, although sales were helped in Europe, China and elsewhere by programs similar to the U.S. government's Cash for Clunkers rebates. GM's crosstown rival, Ford Motor Co., by far the strongest of the Big Three automakers, reported a $1 billion profit for the quarter. The new CEO of Chrysler said its operations broke even in September, although the company did not release numbers. Volkswagen AG and Toyota Motor Corp. both reported quarterly profits of around $250 million, while Honda Motor Co. made a $587 million profit. GM's results can't yet be compared with previous quarters because its accountants are still setting values for its assets and liabilities. Besides unloading all that debt, GM left behind several old factories and some burdensome contracts.